The oldest Russian national theater, the Alexandrinsky has maintained its reputation as a bulwark of theater arts through the country’s turbulent history. On one side, the luxurious building of the Alexandrinsky Theater, designed by Carlo Rossi, overlooks the most beautiful street in St. Petersburg, which carries the architect’s name. The view from the other side is over the Northern Capital’s most famous street, Nevsky Prospekt. Simply by its location, this yellow building with its snow-white columns and sculpted chariots links the modern cosmopolitan city with the Golden Age, when in its audience chamber the great poet Alexander Pushkin weaved “betwixt the chair legs” and novelist Nikolai Gogol prepared for the production of his “The Government Inspector.” Rossi’s design for the theater was finished in 1832 and it was named in honor of Empress Alexandra Fedorovna, wife of Emperor Nicholas I. The date of the decree now is considered the birthdate of Russian theater. 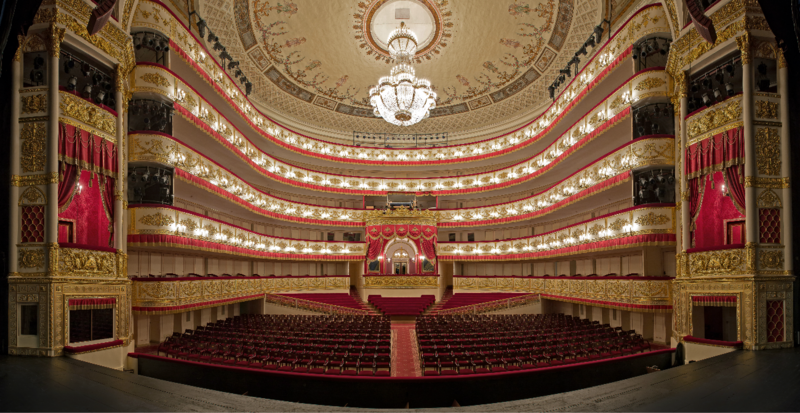 The first theaters built following the order were the Alexandrinsky Theater in St. Petersburg and the Malyi Theater in Moscow. Once it was established, Russian theater was like a magnet, bringing in the greatest minds of the time. At the time the Alexandrinsky was founded, poet and playwright Alexander Sumarokov laid the foundations for Russian drama and legitimized writing as a profession. The next generation saw works by Empress Catherine II on the stage, demonstrating that art was a matter of state importance. She also made court theater accessible to the people of the city. During this era, Denis Fonvizin wrote plays for the stage in St. Petersburg, as did Ivan Krylov. Since its foundation, Russian theater had a European bent, but also it developed its own style. Nikolai Gogol, Mikhail Lermontov, Ivan Turgenev and Alexei Tolstoy were major influences on the creation of Russian theater as its own genre. At the end of the 19th century, the Alexandrinsky, like other imperial theaters, was rocked by the abolition of their monopoly to put on stage shows in St Petersburg and Moscow. A number of privately owned theaters subsequently appeared in the two cities. The Alexandrinsky, however, managed to preserve its unique position due to its reputation as a center of artistic power: Chekhov wrote for the theater, and is also produced plays by artists famous across Europe, including Leon Bakst, Alexander Golovin and Konstantin Korovin. Telyakovsky’s invitation to direct at the Alexandrinsky was one of the most important moments for the theater and the director. Telyakovsky’s 1917 production of Lermontov’s “Masquerade,” which became a symbol of the upheavals that took place during the time of the Russian Revolution, remained in the theater’s repertoire for 30 years. During the Soviet era, the Alexandrinsky became known as a place with strong directors. Sergei Radlov, Nikolai Akimov and Georgii Tovstonogov all worked there. The theater underwent a massive restoration in the mid-2000s, and has now returned to its former glory. The innovative space of its New Stage is now in the hands of directors Valery Fokin and Andrey Moguchii, who work to re-conceptualize the theater’s past and create new traditions.